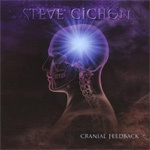 Unfamiliar with guitarist Steve Cichon, his latest release Cranial Feedback came as interesting surprise. With most instrumental releases from latter day guitar virtuosos I expected the usual thing, shred and more shred in the neo-classical vein. I was pleasantly surprised that Mr. Cichon is not concerned only with how many arpeggios he can rip off his fret board. Of course, they are there, and his overall style reminds of Joe Satriani. However, the songs seem more focused on developing sound melodies and progressive compositions. Cichon creates soundscapes that show movement and tones reflecting many musical thoughts from hard rock to metal to classical and Spanish guitar to jazz. At times, as on Siren or Northern Lights, I think I hear Pat Metheney. In this sense, Cranial Feedback is a work of progressive guitar fusion, with plenty of opportunities for Cichon's technical ability to shine. The songs are packed with ingenuity, versatility, and virtuosity, enough so to keep you wondering what's coming next. Creating wonder and expectancy is difficult to capture in a typical instrumental guitar work, but Cichon succeeds. Yet, despite all this well-founded praise, Cranial Feedback stumbles in a very strange way. Cichon attempts to put the work in the context of a live performance by dubbing in a cheering crowd between songs. Sorry, but it sounds cheesy and contrived to me. Bands and their producers have been dubbing live albums since KISS's first Alive album more than 30 years ago, but it doesen't work here. Nevertheless, Cranial Feedback stands on it's own musical feet as an excellent display of Steve Cichon's virtuosity and creativity. Recommended. Steve Cichon's Cranial Feedback is more than a guitar virtuoso mesmerizing with his shred skills. Rather, it's complex and delightful fusion of rich melodies and many guitar tones.